Cedre Sandaraque is, unfortunately for me, the only fragrance I currently have access to from Parfumerie Generale. But judging by how lush Cedre Sandaraque is, I’m going to have to get some more. In Bottle: Warm and dusty with a bit of sweetness to it. Applied: Warm honeyed amber fragrance a touch of sweetness and a delicate tinge of cedar. There’s also a slight tartiness that helps enhance the sweetness of the warm honey-like scent. This is sweet without the obnoxious presence of candy. It’s sophisticated sweet that knows exactly when to stop. It’s an enticing fragrance that draws you in just enough to hook you, not an overwhelming fragrance that gives you what you want and a little too much of it. There’s something about the opening of Cedre Sandaraque that really appeals to me. Maybe because I liken it to the anticipation of satisfaction. It’s like it keeps me there in that giddy stage. It’s really very delightful. As the fragrance ages, a bit more of the cedar comes into the picture adding a dusty woodsy side to the warm honey in the opening. The fragrance dries into an elegant dry and warm woodsy scent. Be careful and go easy on the trigger for Cedre Sandaraque it’s potent and very long lasting. Extra: Parfumerie Generale is a relatively young company. It was launched in 2002 by perfumer, Pierre Guillaume. Design: Most of Parfumerie Generale’s bottles are the same. They’re a functional shape, made of good glass and materials with the company’s logo and the fragrance affixed in a circle on the body of the bottle. There’s not a whole lot to say about this except that it has a likable classic rectangle perfume bottle design with a functional form. Notes: Amber, praline, cedar, vetiver, resin. It seemed like it had been a long while since I smelled a really good oriental fragrance. Cedre Sandaraque’s beauty and warmth make me wonder why I ever take breaks from the orientals at all. 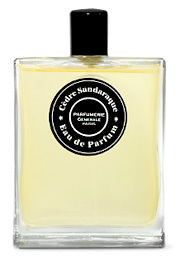 Reviewed in This Post: Cedre Sandaraque, 2011, Eau de Parfum. This entry was posted in oriental, parfumerie generale, Reviews By House, woodsy and tagged amber, cedar, praline, resin, vetiver. Bookmark the permalink.